Player Profile: Bobby Bonds Jr. I have one card of Bobby Bonds Jr., from 1993 Classic Draft. Playing career: The son of Bobby and brother of Barry, outfielder Bobby Bonds Jr. played in the Padres and Giants organizations from 1992 to 1998. In 586 games he hit .250 with 38 HR, 218 RBI and 133 SB. A fuller account of his career can be found at Bleedin’ Brown and Gold. Where he is now: A hitting instructor at BB Grand Slam in South Plainfield, NJ. Google Autocomplete results: He is third when you type Bobby Bond, between Bobby Bonds Stats and Bobby Bonds Hall of Fame, both of which refer to his father. There do not appear to be any other prominent Bobby Bonds Jrs. Coming up next: The next profile will be Ricky Bones. I have nine cards of Bobby Bonds. This one is from 1982 Fleer. Playing career: Outfielder Bobby Bonds was one of the most talented players of the 1970s, hitting at least 20 HR and stealing at least 20 bases nine times in ten seasons from 1969 to 1979. However, like his son Bobby, he was a difficult personality, causing him to bounce around from team to team, ultimately playing for eight teams in fourteen years. The carousel started when the Giants traded him to the Yankees for Bobby Murcer. After one season and two drunk driving arrests, the Yankees shipped him to the Angels for Mickey Rivers and Ed Figueroa in what has gone down as one of the best trades in team history. He would also play for the White Sox, Rangers, Indians, Cardinals and Cubs. Post-playing career: After his playing career he was a hitting coach for the Giants. He died of cancer in 2003. My memories: He was from before my time. Google Autocomplete results: He is fifth when you type Bobby Bo, between Bobby Bottleservice, a TV character, and Bobby Bowden, a college football coach. Another prominent Bobby Bonds is a motocross racer. Coming up next: The next profile will be Bobby Bonds Jr. I have 138 cards of Barry Bonds. This one is from 1990 Donruss. Playing career: If not for steroids, people would probably consider Barry Bonds the greatest hitter of all time. He holds the career record for home runs, 762, and single season record, 73 in 2001 (the only year he hit 50 or more HR). His walk totals are off-the-charts, in large part because his batting eye was so good you couldn’t throw him a strike (and no-one has ever explained how steroids help your battin eye). It’s a shame that his legacy is tainted by his use of a drug whose impact on his numbers can only be guessed at, but not explained. My memories: I never had the visceral hatred of Barry Bonds that seemed to swirl around him even before he joined the Giants. He was just a really good hitter, by the end of his career so good that it was really hard to believe that it was all natural. Where he is now: Bonds returned to the Giants as a spring training instructor earlier this year. He is also currently appealing his obstruction-of-justice convicition relating to the federal investigation into steroids in baseball. Google Autocomplete results: He is third when you type Barr, between Barron’s, the financial newspaper, and Barrio Chino, a restaurant on the Lower East Side. There do not appear to be any other prominent Barry Bondses. Coming up next: The next profile will be Bobby Bonds. I have thirteen Jeremy Bonderman cards. This one is from 2004 Bowman. Playing career: Jeremy Bonderman pitched in 225 games from 2003 to 2013, all but seven of them with the Tigers. He went 69-81 with a 4.91 ERA, putting up decent numbers for some mediocre (and one very good) Tiger teams in the mid-00’s before injuries ruined his career. Where he is now: Bonderman is out of baseball and lives in a mansion on the Columbia River in Franklin County, WA. Last month he was asked by the county to remove some illegal vegetation blocking pedestrian access to the river. Bonderman’s response: "I don't give a (expletive) if they walk down there, but I'm not going to rip out the bushes and stuff." My memories: I remember him as one of the very few good players on the weak Tigers teams pre-2006. I know he beat the Yankees in the last game of the 2006 ALDS – if I remember correctly, it was a weekday day game and I was at worked and was spared the misery of watching it. Google Autocomplete results: He is second when you type Jeremy Bo, between Jeremy Bobb, an actor, and Jeremy Boal, Chief Medical Officer at Mt. Sinai Hospital. There do not appear to be any other prominent Jeremy Bondermans. Coming up next: The next profile will be Barry Bonds. I have one card of Zoilo Almonte, from 2014 Topps Blue. Playing career: Zoilo Almonte came up with the Yankees in 2013 and played in 34 games, hitting .236 with 1 HR and 9 RBI. Where he is now: He has played in 13 games for the Yankees this season, hitting .139 with 1 HR and 3 RBI. He has spent most of the season at AAA Scranton. My memories: He hit well in his first few games with the Yankees, so I was hopeful they had something with him, but it doesn’t look like that is the case. Google Autocomplete results: He is third when you type Zoi, between Zoids, a model kit line, and Zoidberg, a character on Futurama. There do not appear to be any other prominent Zoilo Almontes. Coming up next: The next profile will be Jeremy Bonderman. Pat at Hot Corner Cards is trading team lots for Tigers cards. I claimed the Yankees and got a ton of cool cards. There are still several lots still available so check it out. Here are some highlights from what he sent me. This card immediately caught my eye when I opened the package. Sparkly blue! But the sparkly green may be even cooler! Included was a Yankees Fan Pack from 2008 Upper Deck. It included samplers from a variety of sets, including a glossy version of UD Masterpieces and a silver version of SP Legendary Cuts which I think are unique to the fan packs. I have some of these already so if someone wants some in a trade let me know. I really liked this card, as 1987 Topps is one of my favorite designs, Mark Teixeira is one of my favorite players, and this is a great photo. I have two cards of Daven Bond. This one is from 1991 Line Drive. Playing career: Daven Bond pitched in the Astros, Yankees and Mariners organizations from 1986 to 1992. In 222 games he went 33-40 with 14 saves and a 4.16 ERA. Where he is now: Head Softball Coach at Colorado Christian University. Google Autocomplete results: He is fifth when you type Daven B, between Draven Build, referring to a video game, and Dave & Busters NJ, referring to a restaurant. There do not appear to be any other prominent Daven Bonds. I have six cards of Mark Bomback. This one is from 1982 Fleer. Playing career: Mark Bomback pitched for the Brewers, Mets and Blue Jays from 1978 to 1982. In 74 games he went 16-18 with a 4.47 ERA. Where he is now: Anyone know where Mark Bomback is now? Google Autocomplete results: He is sixth when you type Mark Bo, between Marc Bolan, singer for T. Rex, and Mark Bomback Screenwriter, referring to a writer of Hollywood blockbusters. Another prominent Mark Bomback is a truck driver in Massachusetts. Coming up next: The next profile will be Daven Bond. I have 26 cards of Tom Bolton. This one is from 1994 Collectors Choice. Playing career: Fred Digby was a Red Sox scout who knew he could get a good deal on a Cadillac in Nashville, and wanted to expense his trip, so he decided to check out a high school pitcher named Tom Bolton while he was in town. Digby liked what he saw, and the Red Sox took a flier on Bolton with the 20th pick in the 1980 draft. By 1987, Bolton was in the major leagues, and in 1990 he was a key member of the pitching staff for the 1990 AL East champs, going 10-5 with a 3.38 ERA and pitching three innings of scoreless relief in the ALCS. Overall, Bolton pitched for eight seasons in the major leagues, mostly for te Red Sox but with brief stops in Cincinnati, Detroit and Baltimore, going 31-34 with a 4.56 ERA. A fuller account of his career can be found at The Greatest 21 Days. Where he is now: He works in real estate development in Nashville and is also an instructor at the Nashville Baseball Academy. Interesting facts: Bolton’s wife Diane is an avid marathon runner. In 2013, both Tom and Diane were at the Boston Marathon that was bombed by terrorists. Tom was near the finish line and saw the explosion. Diane had slowed to jog with a friend along the way, otherwise she may have been much closer to the bomb when it went off. It took two hours for the two of them to be reunited. Google Autocomplete results: He is sixth when you type Tom Bol, between Tom Bolles, an artist, and Tom Bolt, Director of Performance Management at Lloyds. Another prominent Tom Bolton is a clown in Germany. Coming up next: The next profile will be Mark Bomback. I have twelve cards of Rod Bolton. This one is from 1991 Classic Best. Playing career: Rod Bolton pitched for the White Sox in 1993 and 1995. In 17 games (11 starts) he went 2-8 with a 7.73 ERA. Where he is now: The Bolton family has owned The Roof Doctor in Chatanooga, TN since 1947. Rod and his brother Greg are the third generation of owners. Google Autocomplete results: He is seventh when you type Rod Bol, between Rod Bolt Protectors, referring to an auto part, and Rod Bolton Cinematographer, an Australian film professional. Another prominent Rod Bolton is President of ITEch in San Diego. Coming up next: The next profile will be Tom Bolton. I have eleven cards of Frank Bolick. This one is from 1991 Classic Best. Playing career: Infielder Frank Bolick played in 96 games for the 1993 Expos and 21 games for the 1998 Angels, hitting .202 with 5 HR and 26 RBI in 258 at-bats. He went on to be a star in Japan, hitting over 25 home runs three seasons in a row. A fuller account of his career can be found at The Greatest 21 Days. Where he is now: A youth coach in Pennsylvania. Google Autocomplete results: He is eighth when you type Frank Bol, between Frank Bolling Stats, refering to the former Tigers and Braves second baseman, and Frank Bologna, a reality show editor. Another prominent Frank Bolick is a securities dealer in North Carolina. Coming up next: The next profile will be Rod Bolton. I have one card of WenDell Bolar, from 1987 ProCards. Playing career: Infielder WenDell Bolar played in the Mariners organization from 1986 to 1988. In 217 games he hit .236 with 10 HR, 74 RBI and 47 SB. Where he is now: A physical education teacher at two elementary schools in Yuba City, CA. My memories: He recently solved a baseball card mystery for this blog. Google Autocomplete results: He is fourth when you type WenDell Bol, between Wendell Bole, who runs a bicycle trail in South Africa, and Wendell Bolton, a special education teacher in Tennessee. There do not appear to be any other prominent WenDell Bolars. Coming up next: The next profile will be Frank Bolick. I have one card of Pat Bojcun, from 1991 Classic Best Batavia Clippers Team Set. Playing career: Pat Bojcun pitched for Batavia in the Phillies organization in 1991 and 1992. In 26 games he went 4-6 with 4 saves and a 5.85 ERA. Where he is now: Founder of the Mid-Michigan School of Baseball, one of the oldest baseball schools in the state. Google Autocomplete results: He is first when you type Pat Boj, ahead of Pat Bojanovic, a sales manager at Emmi Roth USA. There do not appear to be any other prominent Pat Bojcuns. Coming up next: The next profile will be WenDell Bolar. I have one card of Danny Boitano, from 1980 Topps. Playing career: Danny Boitano pitched in 51 games for the Phillies, Brewers, Mets and Rangers from 1978 to 1982. He went 2-2 with a 5.68 ERA. Where he is now: A VP at Valley Wide Beverage in California. Google Autocomplete results: He is the only result when you google Danny Boita. There do not appear to be any other prominent Danny Boitanos. Coming up next: The next profile will be Pat Bojcun. I have three cards of Bruce Boisclair. This one is from 1978 Topps. Playing career: Outfielder Bruce Boisclair played in 410 games for the Mets from 1974 to 1979. He hit .263 with 10 HR and 77 RBI. Where he is now: Anyone know where Bruce Boisclair is now? Google Autocomplete results: He is sixth when you type Bruce Bois, between Bruce Boise Key West, a fishing captain, and Bruce Boise Cephalon, a salesman-turned-whistleblower. There do not appear to be any other prominent Bruce Boisclairs. Coming up next: The next profile will be Danny Boitano. I have one card of T.J. Bohn, from 2003 Bowman. Playing career: Outfielder T.J. Bohn played seven seasons in the Mariners, Braves and Phillies organizations, making the major leagues with Seattle in 2006 and Philadelphia in 2008. In 32 big league games he hit .211 with 1 HR and 5 RBI. Where he is now: Assistant Baseball Coach at Macalester College. Google Autocomplete results: He is third when you type T.J. Bo, between T.J. Boyle, a realtor in Indiana, and T.J. Bowden Death, referring to the grandson of football coach Bobby Bowden. There do not appear to be any other prominent T.J. Bohns. Coming up next: The next profile will be Bruce Boisclair. I have sixteen cards of Brian Bohanon. This one is from 1993 Donruss. Playing career: Brian Bohanon pitched twelve seasons in the major leagues, mostly with the Rangers, Mets and Rockies. In 304 games he went 54-60 with a 5.19 ERA. Where he is now: Sells cars at Texan GMC in Humble, TX. Google Autocomplete results: He is third when you type Brian Boh, between Brian Bohannon, head football coach at Kennesaw State, and Brian Bohling, Founder of Pine Valley Resources. Another prominent Brian Bohanon is Director of Engineering Services at Aaron’s. Coming up next: The next profile will be T.J. Bohn. I have three cards of Brian Bogusevic. This one is from 2011 Bowman. Playing career: Outfielder Brian Bogusevic played for the Astros and Cubs from 2010 to 2013. In 299 major league games he hit .236 with 17 HR and 62 RBI. Where he is now: He is currently in the Marlins organization. In 62 games at AAA New Orleans, he is hitting .240 with 4 HR and 21 RBI. Google Autocomplete results: He is first when you type Brian Bog, ahead of Brian Boggs, a furniture maker in Asheville, NC. There do not appear to be any other prominent Brian Bogusevics. Coming up next: The next profile will be Brian Bohanon. 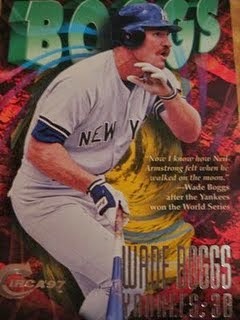 I have 203 cards of Wade Boggs. This one is from 1997 Circa. Playing career: Wade Boggs was one of the greatest hitters of the 1980s, winning five batting titles between 1983 and 1988. Overall, in eighteen seasons with the Red Sox, Yankees and Devil Rays, he hit .328 with 3,010 total hits, 118 HR, 1,513 runs scored and 1,014 RBI. He was an All-Star twelve seasons in a row. My memories: By the time he came to the Yankees he was no longer the hitting machine that he once was, but he was still a very productive member of the lineup. He was also underrated as a defensive third baseman. Boggs is best-remembered by Yankees fans for his tenth-inning, bases-loaded walk to complete the comeback from 6-0 down in Game 4, and for riding a police horse around Yankees Stadium after Game 6. However, he actually hit so badly in the postseason that he was benched in favor of Charlie Hayes, which was why it was Hayes and not Boggs who got to catch the final out in Game 6. Where he is now: He has been coaching baseball at Wharton High School in Tampa for over a decade. Interesting stories: Boggs was always a magnet for attention and controversy. The Margo Adams affair (Boggs getting sued by a former mistress) was one of the first baseball player scandals that I was aware of as a young fan. There were his numerous superstitions, most famously eating chicken before every game, but also running sprints at 7:17 every day and drawing the Hebrew word “Chai” in the batters box every at-bat. Google Autocomplete results: He is second when you type Wad, between Wade Barrett, a wrestler, and Wade, referring to basketball player Dwyane Wade. There do not appear to be any other prominent Wade Boggses. Coming up next: The next profile will be Brian Bogusevic. I have eleven cards of Tommy Boggs. This one is from 1982 Fleer. Playing career: Tommy Boggs was the second overall pick in the 1974 draft, and was in the majors with the Rangers two years later. He had a decent rookie season (1-7 record but with a 3.49 ERA but he struggled mightily in 1977 prompting the Rangers to ship him to Atlanta as part of a four-player trade. He pitched well for Atlanta in 1980 and 1982, but not very well in 1978, 1979, 1981 and 1983. He returned to the majors briefly with Texas in 1985. Overall, in 114 games he went 20-44 with a 4.22 ERA, disappointing numbers for such a high draft pick. A fuller account of his career can be found at the 1977 and 1982 Topps blogs. Where he is now: He is the head baseball coach at Concordia University and owns Austin Slam Baseball. Interesting facts: In 1984 he was sentenced to a year of probation and a $1,000 fine for being part of a sports gambling ring. He claims to have never bet on baseball. Google Autocomplete results: He is first when you type Tommy Bog, ahead of Tommy Bogart, an IT consultant in Phoenix. Another prominent Tommy Boggs is a lawyer and lobbyist in Washington whose firm was recently acquired. Coming up next: The next profile will be Wade Boggs. I have three cards of Mitchell Boggs. This one is from 2011 Topps Update. Playing career: Mitchell Boggs came up with the Cardinals in 2008 and quickly became a key part of the team’s bullpen, pitching in three post-seasons and winning a World Series ring in 2011. In 2012 he had his best season, going 4-1 with a 2.21 ERA in 78 games. However, he imploded in 2013 after being promoted to closer, going 0-3 with an 11.05 ERA in eighteen games. He was sold to the Rockies in mid-season and spent most of the rest of the season in the minor leagues. My memories: I remember him as one of the many bearded Cardinal relievers in the 2011 and 2012 playoffs. Where he is now: He started the season in the White Sox organization, was released in July, and picked up by the Giants later that month. In four games at the Giants' AAA Fresno team, he has allowed two earned runs in six innings. Google Autocomplete results: He is fourth when you type Mitchell B, between Mitchell Blutt, a physician-businessman, and Mitchell Baker, former CEO of Mozilla. There do not appear to be any other prominent Mitchell Boggses. Coming up next: The next profile will be Tommy Boggs. I have two cards of Brandon Boggs. This one is from 2008 Stadium Club. Playing career: Outfielder Brandon Boggs was the Rangers’ fourth-round draft pick in 2004, and in 2008 he broke into the major leagues, hitting .226 with 8 HR and 41 RBI. He made brief appearances in the majors for Texas in 2009 and 2010 and for Milwaukee in 2011 but has been primarily a AAA player since that 2008 season. Where he is now: This year he is at the Braves' AAA team in Gwinnett. In 75 games he is hitting .238 with 7 HR and 27 RBI. Google Autocomplete results: He is first when you type Brandon Bog, ahead of Brandon Bogard, a realtor in New York. Another prominent Brandon Boggs is a basketball player at Western Carolina. Coming up next: The next profile will be Mitchell Boggs. I have one card of Terry Bogener, from 1983 Donruss. Playing career: Outfielder Terry Bogener played in the Rangers, Reds and Orioles organizations from 1978 to 1986. In 1982 he played in 24 games at the major league level for Texas, hitting .217 with a home run and four RBI. Where he is now: Head coach at Estes Park High School in Colorado. Google Autocomplete results: He is first when you type Terry Boge, ahead of Terry Bogard, a video game character. There do not appear to be any other prominent Terry Bogeners. Coming up next: The next profile will be Brandon Boggs. I have one card of Ilya Bogatyrev, from 1993 Topps. Playing career: Ilya Bogatyrev was one of three Russians signed by the Angels in 1992 after the fall of the USSR to promote baseball in that country, with the idea that Russia might be a potential future pipeline for international major league talent. In two years in the Arizona League, Bogatyrev played in 44 games, hitting .241 with 0 HR and 9 RBI. My memories: Only know him from his card. That card was the first I had heard about the Angels’ Russian experiment. Where he is now: Anyone know where Ilya Bogatyrev is now? Google Autocomplete results: He is sixth when you type Ilya Bog, between Ilya Bogdanovich, a software engineering manager at Yandex, and Ilya Bogdanovskiy, a desk support tech at CompuCom. There do not appear to be any other prominent Ilya Bogatyrevs. Coming up next: The next profile will be Terry Bogener. I have fifteen cards of Tim Bogar. This one is from 1994 Topps. Playing career: Infielder Tim Bogar played nine seasons for the Mets, Astros and Dodgers. In 701 games he hit .228 with 24 HR and 161 RBI. Where he is now: Bench coach for the Texas Rangers. My memories: I remember him as a Mets prospect, didn’t realize he actually spent more time as an Astro. Of course, in his recent tenure as Red Sox third base coach he got more national press than many team managers. It seemed like you heard calls for his firing every time a Boston runner was thrown out at home plate. Google Autocomplete results: He is second when you type Tim Bog, between Tim Bogert, a bass guitarist, and Tim Boggs, a TV sound designer. Another prominent Tim Bogar is President of UnFranchise in Harrisburg, PA.
Coming up next: The next profile will be Ilya Bogatyrev. I have 39 cards of Joe Boever. This one is from 1993 Donruss. Playing career: Joe Boever made 516 appearances, all in relief, seven teams over twelve seasons in the major leagues, winning 34 games and saving 49. Highlights include 21 saves for the 1989 Braves, a league leading 81 appearances (and a 2.51 ERA in 111.1 innings) for the 1992 Astros, and a 9-2 record for the 1994 Tigers. Where he is now: A realtor and baseball instructor in Tennessee. One of his teams made the Little League World Series last year. Google Autocomplete results: He is third when you type Joe Boe, between Joe Boehm, a banker in Cleveland, and Joe Boek, a woodcarver in Woodstock, NY. Another prominent Joe Boever is an MMA fighter. Coming up next: The next profile will be Tim Bogar. I have two cards of Dan Boever. This one is from 1989 Best. Playing career: Outfielder Dan Boever played seven seasons in the Reds, Indians and Mariners organizations, including parts of four seasons in AAA. In 667 games he hit .272 with 53 HR and 310 RBI. Where he is now: Though he showed moderate power in his baseball career, he has shown tremendous power in another sport – golf. He makes his living as a long-drive champion and trick-shot entertainer. He has performed in over 1,000 exhibitions and has won many long-drive contests. The Golf Channel once did a half-hour special on Boever, and in 2006 he appeared in the movie Hoot. Google Autocomplete results: He is third when you type Dan Boe, between Dan Boeckner Operators, referring to a Canadian singer and his band, and Dan Boe, a sales trainer in San Diego. There do not appear to be any other prominent Dan Boevers. Coming up next: The next profile will be Joe Boever. I have five cards of Brennan Boesch. This one is from 2012 Topps Heritage. Playing career: Outfielder Brennan Boesch was a decent outfielder for the Tigers from 2010 to 2012. Each season he hit in the mid-.200s with 10-15 HR and 55-65 RBI. However, the team’s signing of Torii Hunter meant they had no room for Boesch, and he was released before the 2013 season. The Yankees, in full search-the-scrap-heap mode that year, brought Boesch on to be a regular outfielder, and in 23 games he hit about as well as could be expected (.275, 3 HR, 8 RBI) but injuries cut his season short, as it did for so many Yankees that year. Where he is now:Boesch played a week in the majors with the Angels in April, getting three hits in thirteen at-bats. He has spent the rest of the season at AAA Salt Lake, where in 76 games he is hitting .320 with 19 HR and 68 RBI. My memories: I remember him as one of the many disappointments of last year’s Yankee team, though I guess in his case it was more due to injuries than ineffectiveness. Google Autocomplete results: He is ninth when you type Brenna, between Brennan’s Tap Room, a bar in Connecticut, and Brennan and Griffin, an art gallery in New York. There do not appear to be any other prominent Brennan Boesches. Coming up next: The next profile will be Dan Boever. I have one card of Madison Boer, from 2011 Bowman Draft Picks & Prospects. Playing career: Madison Boer was the Twins’ second-round pick in 2011. That year, he had success in the bullpen at Rookie-league Elizabethton, going 2-1 with 9 saves and a 2.60 ERA. In 2012, he was promoted to Class-A+ Fort Myers and made a starter, with dismal results (7-10, 6.41). In 2013, He was demoted to Class-A Cedar Rapids and sent back to the bullpen, where he went 1-1 with 7 saves and a 3.04 ERA. Where he is now: This year he is back at Fort Myers. In 33 relief appearances he is 1-2 with 6 saves and a 4.40 ERA. Google Autocomplete results: He is third when you type Madison Boe, between Madison BOE NJ, referring to a board of education, and Madison Boell Twitter, referring to a young woman’s social media feed. There do not appear to be any other prominent Madison Boers. Coming up next: The next profile will be Brennan Boesch. I have four cards of Brian Boehringer. This one is from 1997 Fleer. Playing career: Brian Boehringer pitched ten seasons in the major leagues for the Yankees, Padres, Giants and Pirates. In 356 games he went 26-32 with a 4.32 ERA. My memories: I remember him being pretty awful on the 1996 Yankees, probably the worst pitcher on that team that would win the World Series. I was surprised looking at his stats that, though he was bad that year (2-4, 5.44) he actually pitched quite well in two later stints with the Yankees and overall in his decade-long career. I guess first impressions matter. Where he is now: A scout for the Diamondbacks. Google Autocomplete results: He is first when you type Brian Boe, ahead of Brian Boemper, a landscaper in Mount Sinai, NY. Another prominent Brian Boehringer is an electrical engineer in Tempe, AZ. Coming up next: The next profile will be Madison Boer. Outfielder WenDell Bolar played in the Mariners organization in 1986 and 1987. Now an elementary school PE teacher in Yuba City, CA, I reached out to him for baseball card stories. He responded by leaving a comment on my blog post from two years ago regarding the mystery card in the 1987 Wausau Timbers set. In that set there is a card with no name and nothing on the back to indicate who the player was. "That's Fausto Ramirez! He played SS/2b behind Mike McDonald and Greg Briley." The mystery is solved - the player in the picture does look like Fausto Ramirez. Ramirez actually did not end up playing for Wausau in 1987, instead spending a second year at Belllingham. (He did get promoted to Wausau in 1988). It seems likely that Ramirez was originally going to be with Wausau, but was instead sent to Bellingham at the last minute, and ProCards removed his name and information but never fully removed him from the set. 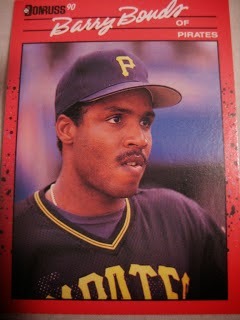 I could only find a very small photo of Ramirez online, but he does appear to be the same person on the mystery card. Thanks, WenDell Bolar, for clearing up a baseball card mystery! Here is his card from that ProCards set.